Bringing a little piece of Italy to America is the Alfa Romeo Stelvio. This sporty SUV runs on a 2.0-liter, inline-four cylinder that produces 280 horsepower. This 8-speed automatic transmission reaches 60 mph in only 5.4 seconds. Whether you’re taking trips to the grocery store or hitting the open road, the Stelvio will turn heads and provide top performance while doing so. When compared to competition like the Porsche Macan, Acura MDX, BMW X3, and more, the Alfa Romeo Stelvio stands out with top performance. The Alfa Romeo Stelvio reaches a top speed of 144 mph that blows away what competition delivers. The shift-by-wire integrated transmission allows for faster and more precise gear changes. With Steering Column-Mounted Aluminum Paddle shifters you’ll have a more reactive drive making your commutes to and from work feel like you’re on the racetrack. Competition lacks when it comes to a responsive chassis like the Stelvio offers drivers. The Stelvio adapts to any situation and environment thrown its way with all-wheel drive. Adding to the responsiveness is the Alfa DNA Drive Mode Selector System that automatically modifies the Stelvio’s responses and adjusts, in real-time, the required torque to each wheel based on the conditions of the terrain. Available technology the Stelvio offers also outshines competition. When you sit inside the Stelvio technology features take your driving experience up another level. Features include Apply CarPlay and Android Auto, 6.5-inch widescreen color display with Bluetooth, 7-inch TFT Cluster with Dynamic Display Controller, 8-speaker audio system, dual-zone climate control, Passive Entry with Keyless-go, remote start, powerlift gate and more! 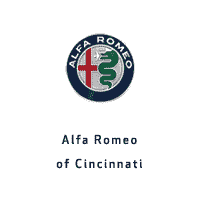 If you’re ready to take a look at the Alfa Romeo Stelvio, stop by Alfa Romeo of Cincinnati. Our associates will work with you to find the perfect SUV for you and set you up for a one-of-a-kind test drive.